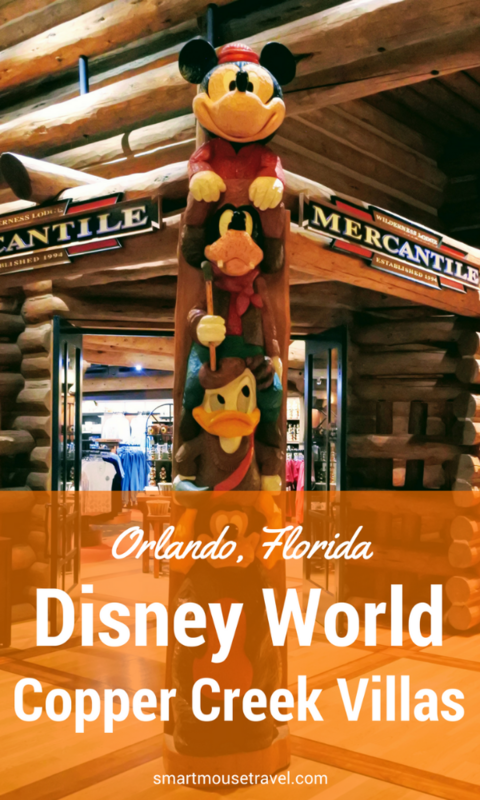 Disney World has dozens of on-site resorts to choose from and each resort has its own special style. 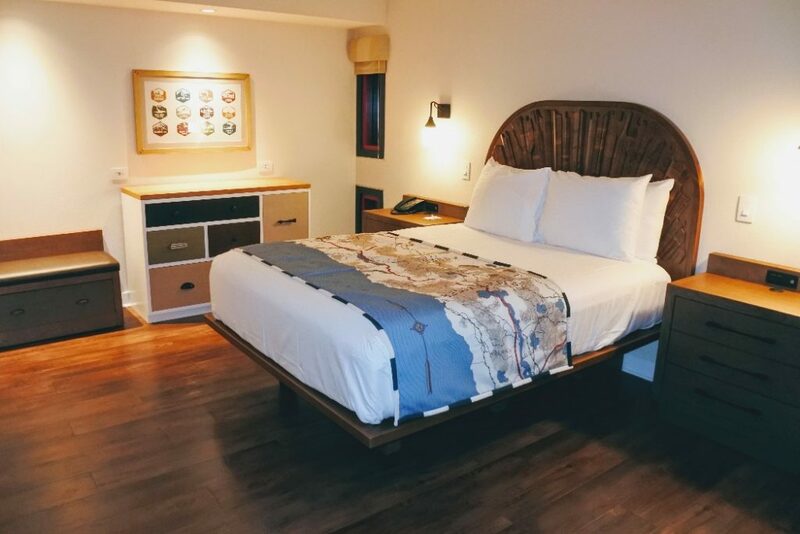 Copper Creek Villas and Cabins at Disney’s Wilderness Lodge is a new property that opened in July 2017 and we couldn’t wait to see what this new resort had to offer. Copper Creek Villas and Cabins at Disney’s Wilderness Lodge are considered a Magic Kingdom area resort. Copper Creek Villas and Cabins at Disney’s Wilderness Resort has a great outdoorsy vibe and looks like a huge log cabin. 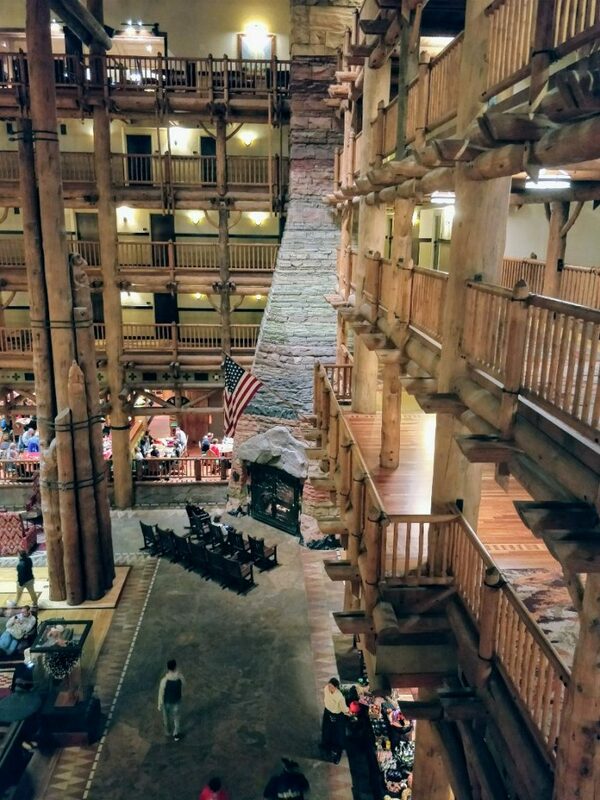 The immense open air lobby has intricately carved totem poles and a fireplace 82 feet (25 meters) high. This fireplace immediately made me think of Mary Coulter’s geological fireplace from our trip to the Grand Canyon. I don’t think this is by accident. Look for a case containing various rocks of the Grand Canyon located to the side of this grand fireplace. Keep an eye open for the geyser located past the Copper Creek Springs Pool, too – it is another great nod to U.S. National Parks. Want to kick back and enjoy the ambiance? There are many couches, chairs, and coffee tables in the lobby for you to lounge. Warning: If your kids are anything like mine they will become obsessed with the bridge in the back of the lobby. 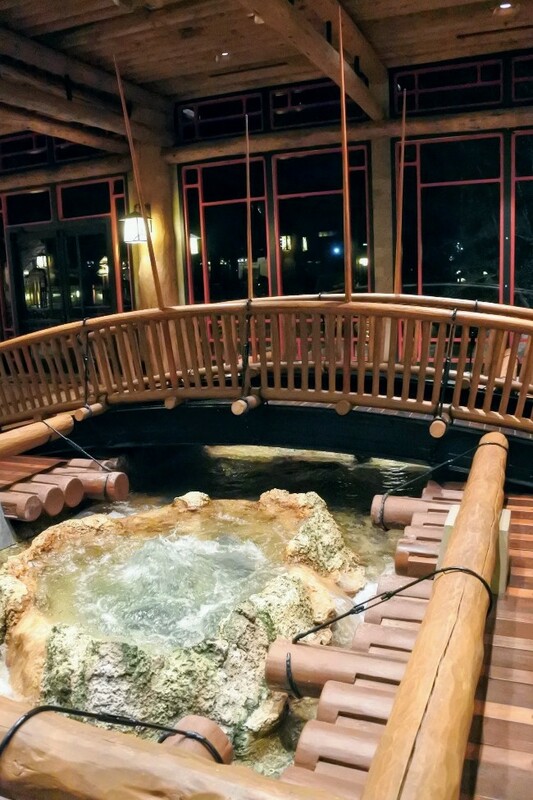 This bridge spans the start of a creek located in front of the Copper Creek Villa elevators. Your child will never get tired of crossing this bridge! 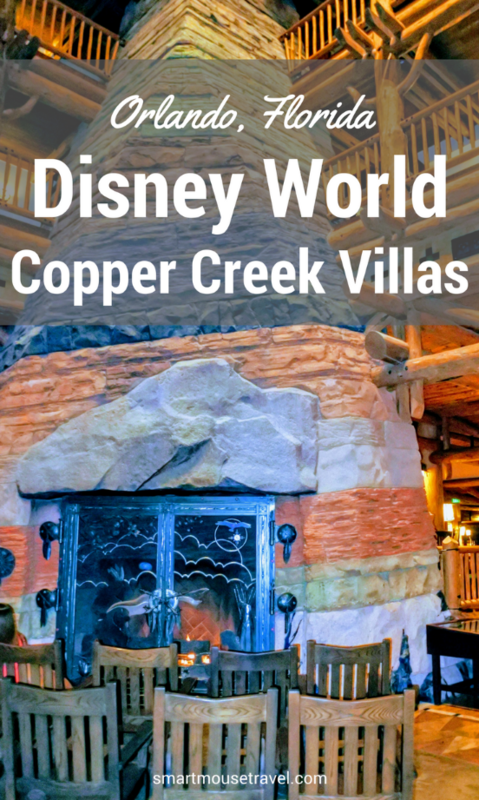 Copper Creek Villas is one of two Disney Vacation Club properties located on the Disney’s Wilderness Lodge grounds (the other is Boulder Ridge). The elevators for Copper Creek Villas are accessed via the same lobby as Disney’s Wilderness Lodge. If you are staying in one of the gorgeous cabins you will do a little more walking, but it sure looks worth it! There are two pools to choose from during your stay: Copper Creek Springs Pool or Boulder Ridge Cove Pool. The weather was unusually cool for October, so we got to enjoy the view of the pool but not actually try it out. 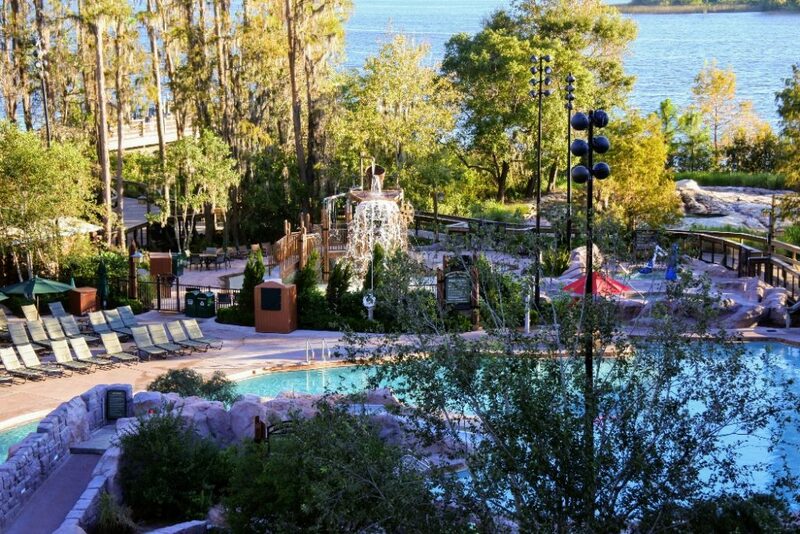 The Copper Creek Springs Pool is the larger pool with an additional water play fort located directly behind Wilderness Lodge. This pool is also only a short walk to Geyser Point Bar and Grill. The Boulder Ridge Pool is located closer to the Boulder Ridge Villas, is a little smaller, and is billed as a having “laid back charm”. 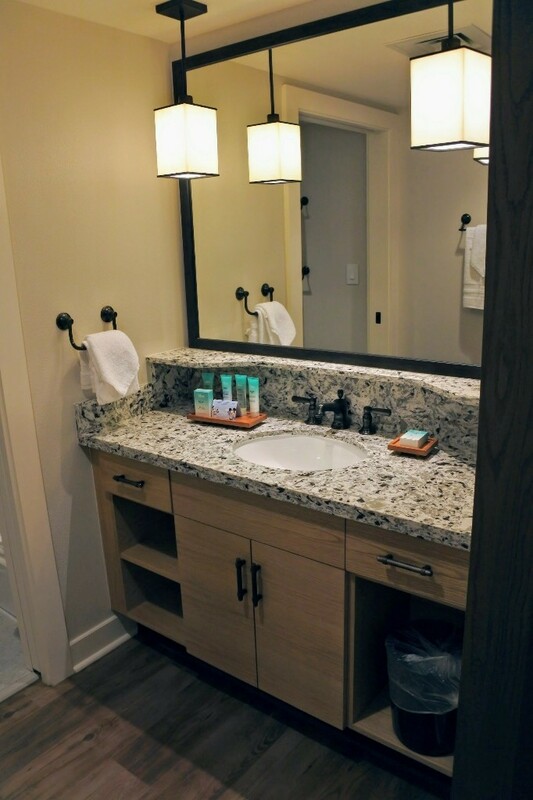 There are several dining options at Copper Creek Villas and Cabins at Disney’s Wilderness Lodge ranging from fine dining to quick grab and go options. Artist Point is a fine dining restaurant that serves dinner only. Geyser Point Bar and Grill is located just past the Copper Creek Springs pool and brings an elevated menu to outdoor eating. They serve breakfast, lunch, dinner and bar service, too. Roaring Fork is a quick service spot that serves breakfast, lunch and dinner quick service style. You can also grab pre-packaged snacks here. Whispering Canyon Cafe serves all you care to eat buffets for breakfast, lunch and dinner with a side of sass. Our server threw napkins and straws at us, so be prepared for some laughs. There are two very different layouts for Copper Creek Studio Villas. The majority of studios are one large rectangular room with a small kitchenette (see the usual layout here). Ours was quite different. We were super lucky to get a unique studio at Copper Creek Villas. Our room (5115) was located on a corner of the resort and had a fantastic layout. When you enter the room you walk past a large closet into the kitchenette and living area. This living area has a fold-out couch and access to the balcony overlooking the pool. There is a small walkway that then leads from the living area to the main sleeping area with a queen size bed. This bit of separation between the living/kitchenette and bedroom area was a pleasant surprise. 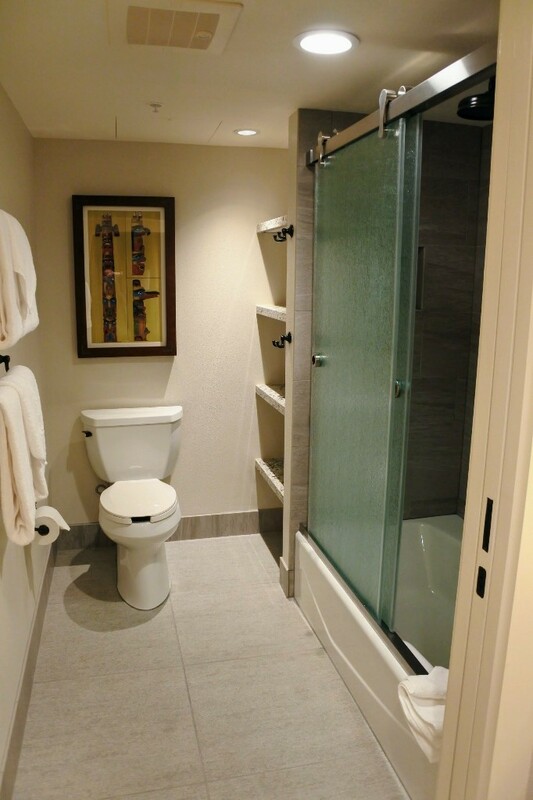 The large bathroom has distinct sink and shower/toilet areas, separated from one another by a pocket door for privacy. 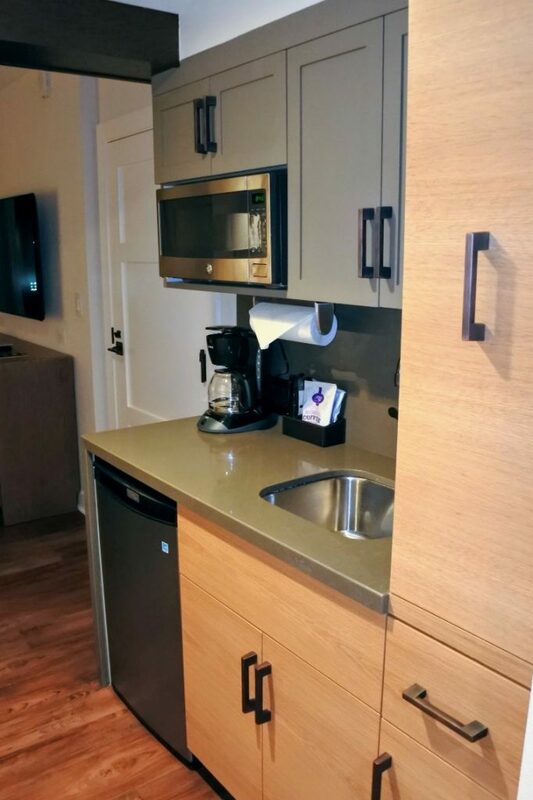 Kitchenette with coffee pot, toaster, mini-fridge (no freezer), sink, wine opener, 4 coffee mugs, 4 glasses, paper plates, paper bowls, and plastic utensils. I only have one complaint about our studio at Copper Creek (which is the same complaint I had when reviewing Disney’s Beach Club Resort). Sleeping in is difficult since the window shades let in a lot of morning light. 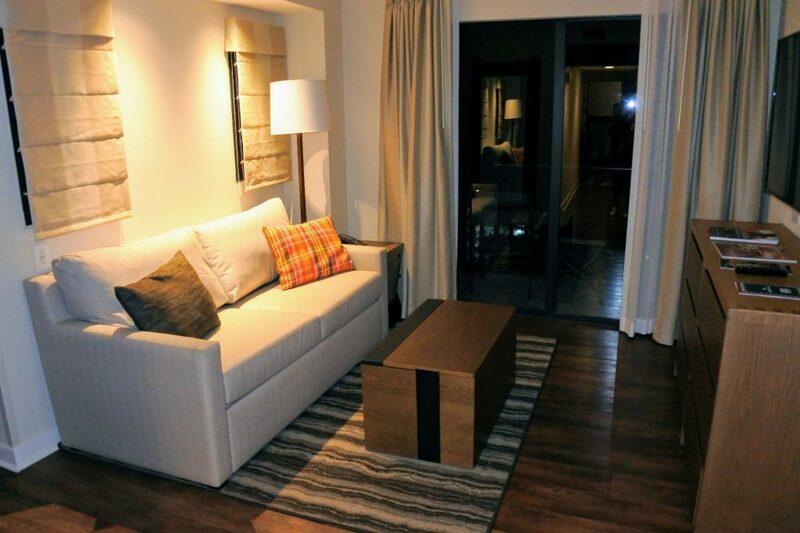 Your stay at Copper Creek Villas includes free WiFi access. This complimentary WiFi is good enough to check email or do some social media activities but insufficient for streaming Netflix or other video. Plan ahead and save videos to your device before leaving home. Overnight self-parking is available at a charge of $24 per night for hotel guests. To access Magic Kingdom you will take a boat from Copper Creek at Disney’s Wilderness Resort. The boat goes directly from the dock located behind the resort to Magic Kingdom on a continuous loop. Disney’s Wilderness Lodge and Disney’s Fort Wilderness Cabins and Campgrounds are different resorts and require boat transportation to access each other. Find the boat dock behind the Wilderness Lodge. This loop takes you to Fort Wilderness Resort or Disney’s Contemporary. To access Epcot, Hollywood Studios, Disney Springs or the water parks you will take a Disney shuttle bus. Find all of these bus stops in front of the resort. Our room was a wonderful surprise with its unique layout and quiet placement in the resort. There was an amazing amount of storage. The bathroom size and setup exceeded my expectations, too. Our kitchenette and 2-person table was good enough for us to have our breakfast in the room (I pre-ordered groceries from Garden Grocer). This saved us time, money, and hassle in the morning. If you love this room but don’t love the price tag, find out how you may be able to stay here for less. 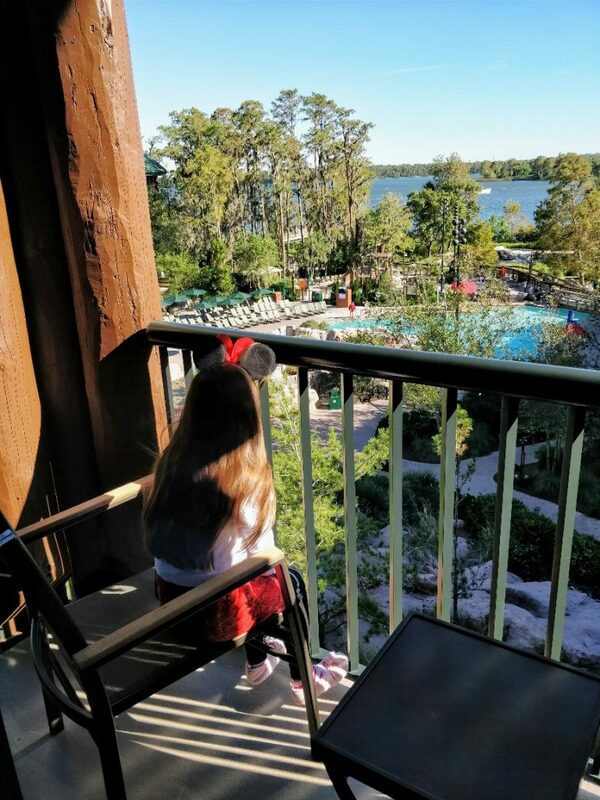 Copper Creek Villas at Disney’s Wilderness Lodge is fantastic. The perfectly executed wilderness theme and nod to U.S. National Parks made us fall in love. Our view of the lake behind the lodge was so beautiful you could forget you were at Disney World and instead imagine you were on a luxury camping trip. Please note that the studio we stayed in is not the normal layout. Staff confirmed that the Copper Creek Villa Studio rooms ending in X115 have this room design. Our room was 5115. Information presented is correct at time of publishing and is based on Disney World Cast Member responses and our own experience. Previous Post:Is Mickey’s Very Merry Christmas Party Worth The Expense? Hello and Thanks for the great review. Can you tell me where the small table with 2 chairs is in this “alternate studio” layout (is it just on the balcony or is there a table/chairs inside too, like there is in the “normal” studio layout)? I’m glad you found the review helpful! A small dinette table and two chairs are located inside near the bed in the alternate studio layout at Copper Creek.